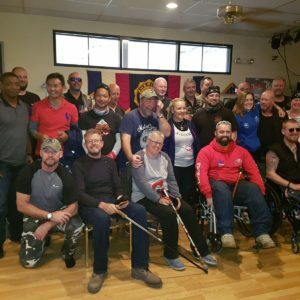 Wild West Challenge is one of the numerous events that help suffering Wounded Injured and Sick (WIS) soldiers and veterans enlighten the darkness. Bike tour for the Wounded (BT4TW) is a not-for-profit Community Interest Company that provides direct and indirect support to both serving members and veterans of the UK Armed Forces. It supports WIS soldiers from various services and ranks, where their injury whether physical or mental is considered to be career limiting. 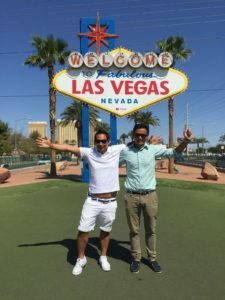 The tour was held in USA from 2-12 September 2017 where twelve WIS personnel including two Gurkhas were on the team. We were also accompanied by two American counterparts throughout the journey. 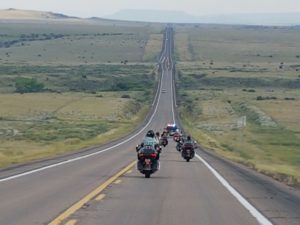 The tour started from Las Vegas, Nevada across four other states: Utah, Colorado, New Mexico and Arizona, riding just over 2,000 miles. 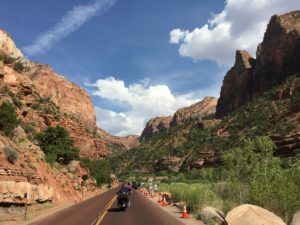 In Nevada, we rode through Lake Mead National Park, Zion National Park, Bryce Canyon National Park and Devil’s Ridgeback. 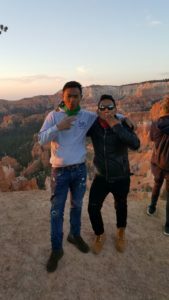 Visit to Bryce Canyon mesmerized everyone, as it felt like we were in a different planet. It is phenomenal how it was formed and the sunrise view from the Canyon was breath taking. Balding Town in Utah and the oil fields in New Mexico were such a beauty. 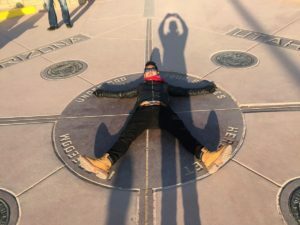 We also visited the Four Corner Monument which is the only corner where the four states Utah, Colorado, New Mexico and Arizona collide. This was one of the main attractions for the visitors. Arizona itself is as twice as big as Nepal. The locals were gathered to welcome us in Springville town. The Sheriff escorted us to and from the city with their 6 vehicles. Receiving “thanks for your service’’ hand crafted cards from small kids was heart touching. 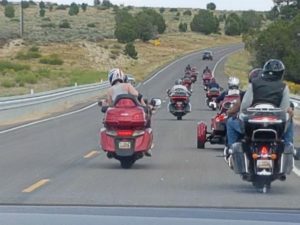 The Devil’s Highway Route 666, is considered to be one of the deadliest roads in America. Riding a bike through it is said to be at the top of every bikers’ bucket list. However, it seemed pretty normal to us as Gurkhas, as we have seen and crossed more dangerous roads in Nepal. Tombstone town is one of the oldest cowboy towns preserved as it is since 1881. Many cowboy’s movies such as “Justice is coming” were screened in the town. We stayed 2 days in Tombstone which had a motto “Too Tough to Die’’. This town is also famous for “Gunfight at the O.K. Corral’’ where there was a 30 second shootout between lawmen and the Cowboys in 1881. This has been regarded as the most famous shootout in American Wild-West history. There was a heavy rainfall as we drove through Lake Havasu City and all soaked from head to toe. We were invited by the American Legions. One of the Legions humorously said it rains once in a year and we brought the rain with us. Members of the American legions were standing in rows, welcoming us with towels in their hands. They hugged and thanked us for our service to the country. While we were having normal a normal conversation, one of the legion’s members found that we were GURKHA! They expressed that they have a huge respect for the Gurkhas. We were emotionally overwhelmed to realise how rich we were in the history made by our forefathers. That was one of many proud moments we had throughout the journey. We would like to express our sincere thanks to our tour guides Darren Clover and Mike Hemming and also Amy Clover who played the role of tour support and administration prior the event. It would not have been possible without the contributions from our experienced riders who dedicated to lead and guide us throughout the tour. 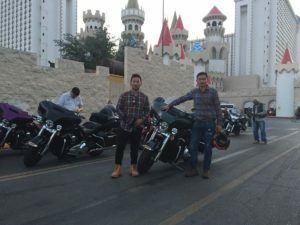 This tour has been once in a lifetime experience for both of us which enriched our global knowledge and broadened our friendship circle that will always be cherished. We do not want any of our comrades to suffer in silence after dedicating and sacrificing their lives to the country. There are so many agencies which are working so hard to help us. Please support info@bt4tw.co.uk so that none of our WIS soldier and Veteran will suffer in the darkness. At last but not the least our heartfelt thanks to Colonel James Robinson, Colonel Brigade of Gurkhas, providing information and link to BT4W through Major Dammar Bahadur Shahi, SO2 Pers-Pol and Brigadier Gerald Strickland Colonel Royal Gurkha Rifles (RGR) for authorising initial funding from RGR Trust Fund for this tour. We encourage our fellow WIS Gurkhas to link with SO2 Pers-Pol in Headquarters Brigade of Gurkhas and take part in similar events organised by the various charity.